Well, it wouldn’t be Halloween without a Tatuaje Monster series right? Today I take on the Krueger paired with a bottle of 2015 Goose Island Bourbon County Stout. It’s that time of the year folks! One of the most popular, sometimes elusive releases just hit shelves. I’m talking about the the Tatuaje Monster series. This ninth release in the Series is called the Krueger and is designed after none other than the man nightmares are made out of, Freddy Krueger himself. For those who have been living under a rock for the last 10 years, Pete Johnson of Tatuaje Cigars releases a Halloween specific blend each year just before the holiday hits. I have had the pleasure of smoking each and everyone, and plan on keeping that tradition up as long as I can. Here is the rundown of the releases. Produced a the My Father Cigars S.A. factory in Nicaragua, this year’s format utilizes the Conjonu 2009 molds but were cut a bit longer. It closely resembles the format of the Wolfman coming in at a 7 1/4 x 48 box-press with a tapered torpedo style cap. 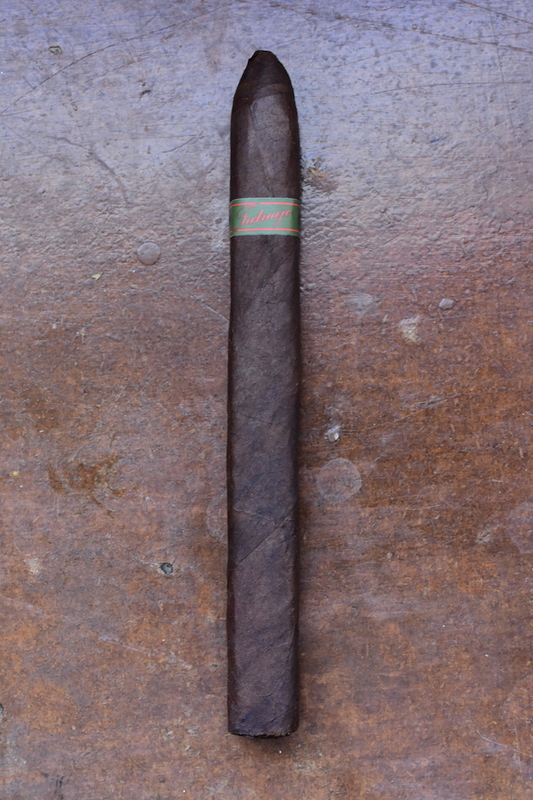 The blend features a Mexican San Andres Maduro wrapper, Nicaraguan Binder and Nicaraguan Filler tobaccos. The Krueger comes packaged in Dress Boxes of 13, and standard non-Dress Boxes of 10 running $13 a stick and won’t last long. I purchased a few of these over from our friends at 2 Guys Smoke Shop. At the time I am writing this it looks like they have already sold out. 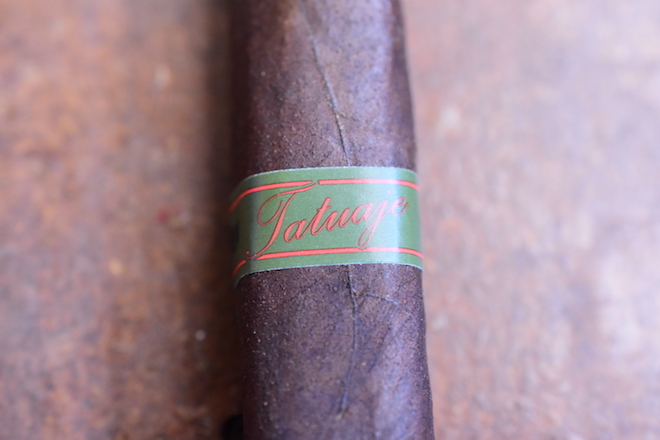 The Tatuaje Krueger starts out with a very consistent, deep, dark brown wrapper. 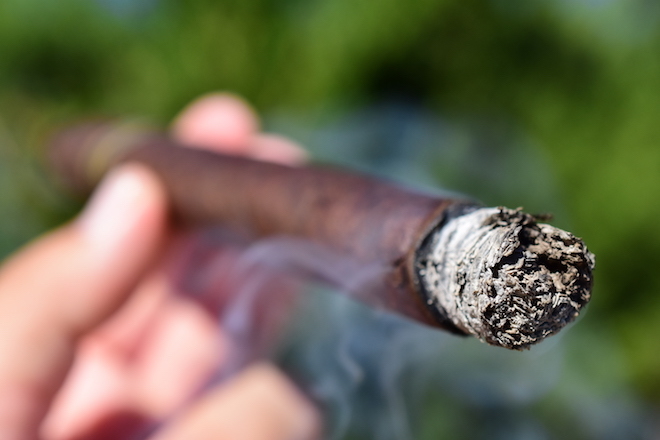 While the wrapper is already dark, you can still see many natural dark webs reaching through the cigar’s wrapper leaf. 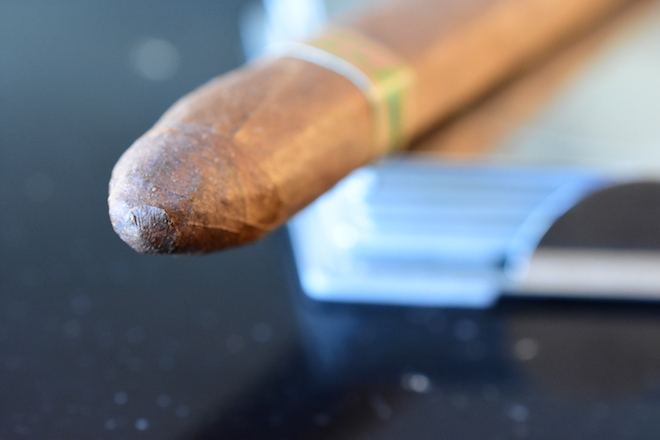 The texture of the cigar is incredibly toothy and firm. It feels like extra gritty sandpaper wrapped around a stack of popsicle sticks. 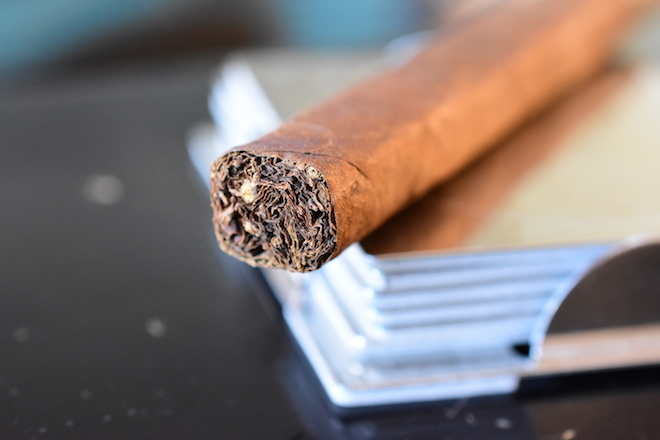 The entire cigar is very solid and firm and feels incredibly tightly packed while the wrapper itself is very dense and very hard. The long, slender body carries a comfortable soft box-press which leads up to a very long, pointed, tapered cap. 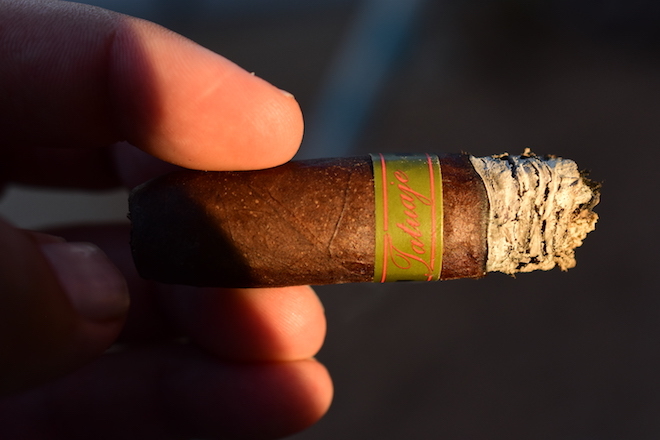 The cigar is polished off with the same Tatuaje and we see on just about all of their cigars with the standard monster twist, carrying a red, green, and black design which matches the clothing worn by Freddy. 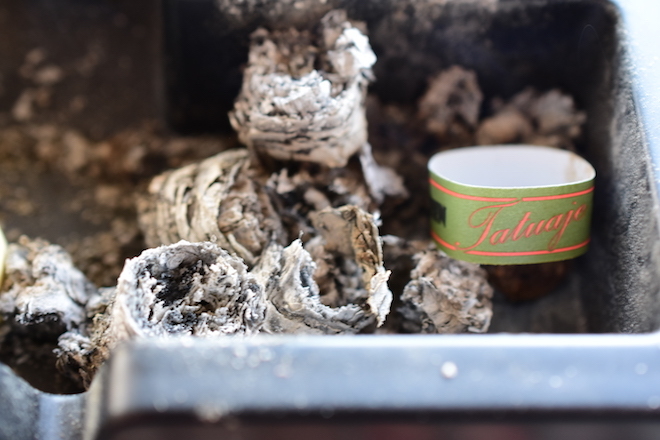 The wrapper of the Tatuaje Krueger gives off a good amount of spice, cocoa, and cedar while the foot of the cigar carries more pepper than spice, natural tobacco aromas, and a good amount of earthiness. The cap cut clean and easily using my Xikar double bladed cutter. The cold draw produces some great tart, cocoa, spice, and rich tobacco flavors. Woah! I wasn’t prepared for the sheer amount of bold cayenne pepper the Tatuaje Krueger was about to give off. After the first few puffs my lips and tongue were left burning for a few minutes. After about a quarter inch the pepper starts to give way and it opens the doors for the tartness, cocoa, spice, molasses, and rich oak that lies within the cigar. The draw is perfect, each tiny puffs releases a huge cloud of thick white smoke while the cigar gives off a decent amount of stationary smoke while it rests in my ashtray. The burnline is dead even and razor thin leaving behind a compacted trail of medium and dark gray striped ash which held on for an inch before giving way. The Tatuaje Krueger is really coming to life in the second third. The flavors lead with a deep, rich oak, bold bittersweet chocolate, a nice natural tartness, a good amount of spice, and a bit of pepper that is still somehow lingering around. The retrohale is a great reminder of just how potent that pepper was to start off the cigar and I really doubt I’ll find myself retrohaling this cigar very often. The burnline is still dead even and very sharp, while I close out the second third already with a nice little nicotine kick. 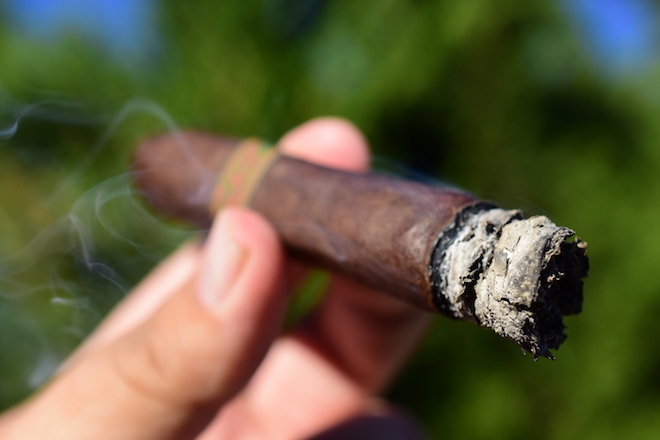 The Tatuaje Krueger finishes just as bold as it started with a ton of bittersweet chocolate, spice, tartness, cinnamon, and pepper with some soft notes of pine and clove. This is one of the better Monster Series releases in my recent memory. I smoked it down to the very nub which took just over two hours and I experienced no extra harshness or extra heat. In fact, I was able to take this cigar down much easier than most cigars with half the body and strength which is pretty surprising considering how full body and strength the Krueger is. As I stated, this was one of the better Tatuaje Monster Series I’ve had. Not that any of them are bad, or even close to it. But the Krueger seems to stand out amongst them. The cigar is very strong, and very bold, yet I never once felt overpowered by it which is great considering how long the smoking time was. I wouldn’t recommend this for those novice cigar smokers though. I just think its a bit much and if you aren’t used to smoking full-strength cigars it might do you in. I know its pricey, I know its hard to find, but in all honesty if you see them I recommend snatching up quite a few of them. I’m glad that I did. Good Island’s Bourbon County Stout is another beer that isn’t a stranger to Casas Fumando. As the released of the 2016 version grows near I dipped into my stash to put a few of the 2015 on ice. Brewed at the Goose Island brewery in Chicago this Bourbon Barrel Aged stout comes in at a whopping 14.3%. At least in these parts, in other parts of the country a less potent version is found on shelves. The Bourbon County Stout leads with a ton of sweetness, rich bittersweet chocolate, cinnimon, spice, a bit of clove, lots of roasted malt, and even a bit of raisin with a very, very mouthfeel before finishing very sweet with a good amount of bourbon and booze over more chocolate, roasted malt, spice, and raisin with a very boozy aftertaste. 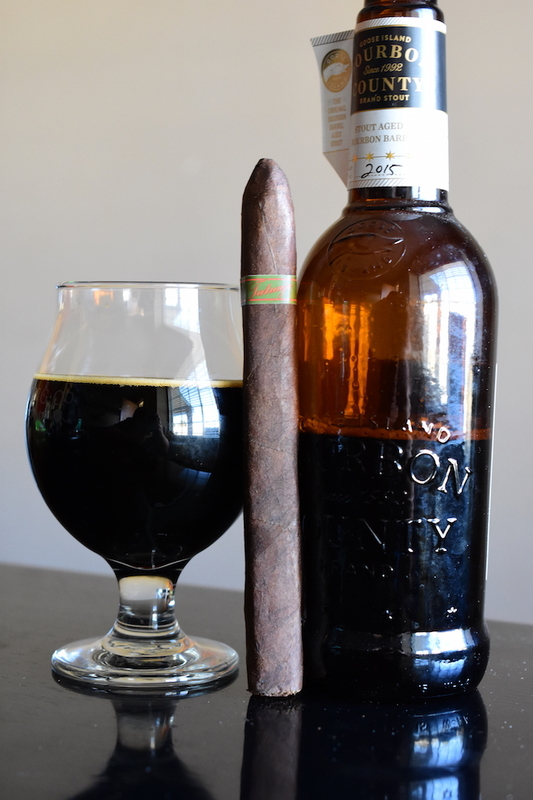 I love this beer, and knew right away it would have to go down as the pairing with this cigar since the flavors were so compatible. Pete really raised the bar with this edition of the Monster Series.. The Krueger was in my top 10 for 2016. I disagree about the price point however. When you consider the smoke time and great flavors and construction of the cigar, I find it more than fair. Newbies should stay away because this one does pack some serious strength. Brilliant cigar for the experienced.